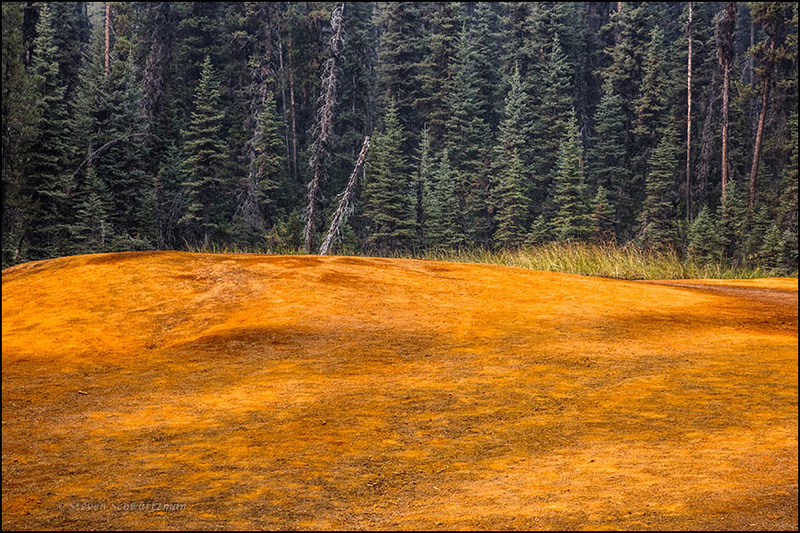 Yes, the orange colors make this place in eastern British Columbia quite an attraction. Very impressive pictures, Steve. I especially like the second one because of the reflections: a perfect shot. It was the reflections that especially caught my attention, leading me to try various compositions. 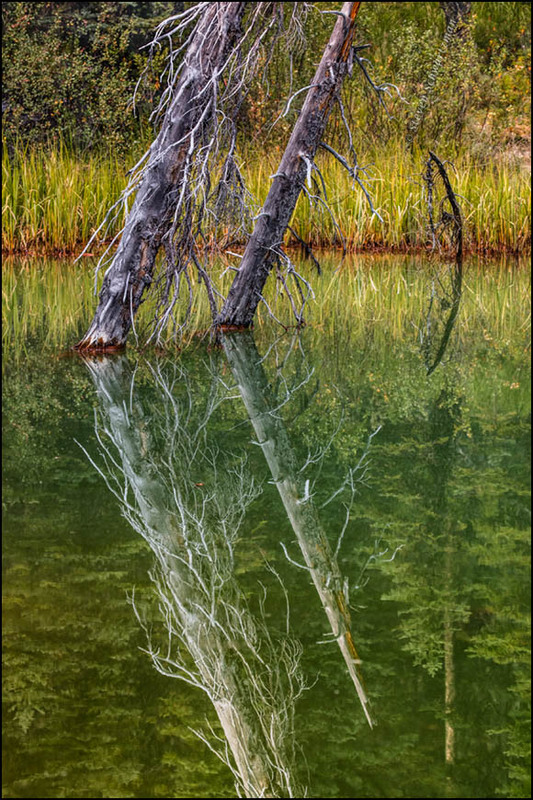 One thing that’s curious in this take is that the reflection in the lower right of a vertical tree trunk has no counterpart up above, the way the two slanted reflections do. I hadn’t noticed that about this trunk in the lower right. But taking a second and much closer look, I think I discovered why: the lower part of the “real” trunk seems to be behind the reeds and bushes. It looks like there’s just the beginning of it visible at the very upper fringe of the picture. I believe you’ve got it right. The real tree had to be up there somewhere. Still, I like the superficially ghostly apparition. Is it due to any geological phenomenon…like presence of minerals? It was the second view that intrigued me, too. I took variations of it, always with the reflections as the highlight of each image. I can’t help seeing a giant pile of turmeric in the first photo. You’re right that the blocks of color contrast, but they complement one another as well. As for the second? 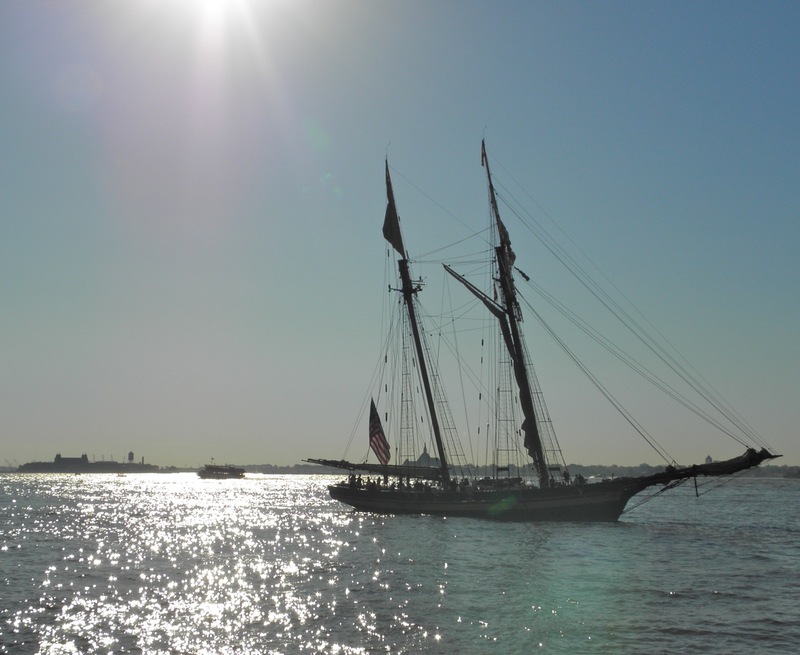 “Ghostly” is just the right term, since I see a sunken schooner with its slanted masts rising above the surface of the water. You may have found one of the world’s most unique pond yachts on your trip! Leave it to nautical you to see the slanted masts of a schooner here. While my vision didn’t get into greater bodies of water than this pond, its ghostly trees took me traveling in the schooner of my imagination. I really enjoy looking at these two images. It is fun to think how startled the first white people must have been when they stumbled upon these scenes. And how startled a few must have been when they stumbled into them.